Mountain rescue teams had to battle through gales and rain to rescue a woman who had been blown off her feet on Snowdon during Storm Brian. The walker had to call for help after hurting her ankle and finger just over half way up the 3,560ft (1,085m) mountain on Saturday afternoon. Sixteen Llanberris mountain rescue volunteers took four hours to reach her and bring her down on a stretcher. Meanwhile, a windsurfer was helped by the RNLI at Abersoch beach in Gwynedd. Storm Brian brought gales across Wales on Saturday, causing disruption, power cuts and flood warnings. On Snowdon wind speeds peaked at 112mph (180km/h), a Llanberis Mountain Rescue Team spokesman said. Rescuers were called by North Wales Police after the woman - who was walking with others up the mountain - was blown over and suffered a suspected broken ankle at about 12:40 BST. 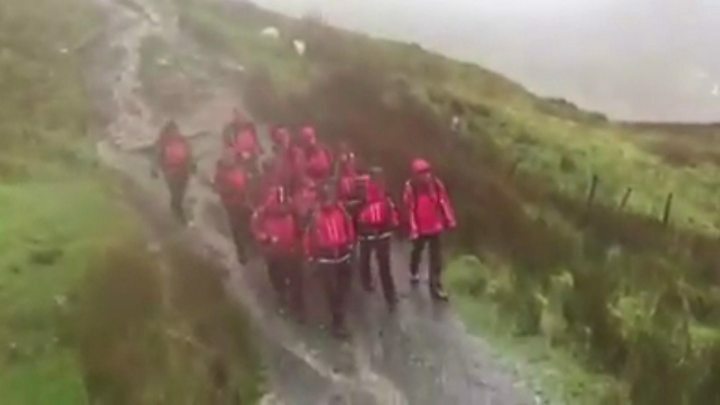 After reaching her, they put her on a stretcher and carefully made their way down Llanberis Path, which was described by volunteers as "running like a river". John Grisdale, vice chairman of Llanberis Mountain Rescue Team, said: "It was extremely difficult and extremely wet. "She was just over half way up the mountain and had been blown off her feet. "The storm was at its worst. We had to carry her down on a stretcher and it was very challenging - the rain was horizontal. It was quite a task." The woman was then transferred to an ambulance at Llanberis and taken to hospital at Ysbyty Bangor. Llanberis is the busiest mountain rescue team in the country and the rescue on Saturday marked its 200th call-out of the year - the third year in a row it has topped 200. Mr Grisdale said: "It's the same message we keep issuing - people should be prepared before they go up Snowdon and part of that is checking the weather forecast." The RNLI was also called out during the storm on Saturday morning after a windsurfer got in difficulties when his rig failed in the high winds. Abersoch RNLI said: "He was located a few hundred yards out from the main beach within minutes of the launch. "He was brought back to the lifeboat station along with his windsurfing gear."